What kind of karate is this? The name of the style is "Seido", pronounced "say-dough" and meaning "sincere way". 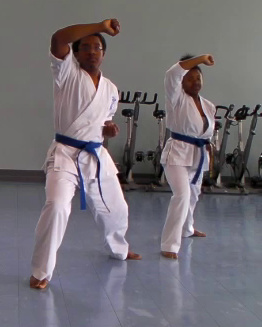 It is a Japanese style, most closely related to the Kyokushin, Shotokan, and Goju-ryu styles. Who founded it? How long has it been around? Kaicho (Chairman) Tadashi Nakamura founded Seido Karate in 1976. He is a kudan (ninth degree Black Belt) who was a leading student in the Kyokushin-kai style of karate until philosophical differences with his teacher led him to leave and found Seido Juku. Who teaches the classes in Catonsville? Catonsville Seido Karate classes are taught by Kyoshi Tom Swiss, a fifth-degree black belt who started his karate training in 1985. Do you have to have previous experience, or be in great shape, to start training? Seido also makes a special effort to accommodate students with special needs, including disabilities. Yes. However, students do not begin free sparring until they've reached the level of Green Belt, which usually takes at least a year; and safety rules, including the use of protective gear, are closely followed. Do you do forms (kata)? Yes. 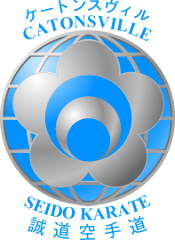 The Seido curriculum includes a total of over twenty kata, with students learning one or two new ones at each belt level. Yes. Students are encouraged to participate in kata competition in one of a handful of traditional karate tournaments (including the annual Seido benefit tournament), and students of the appropriate rank levels may compete in kumite (sparring) as well. However, competing is not mandatory, nor is it the primary focus of training. Yes, however since weapons are viewed as extensions of the body, weapons training is reserved for advanced students. Black Belt students train with bo and jo (short and long staff), and basic knife techniques. Yondan (fourth degree Black Belt) students also train with sai. What are the belt colors? What do they mean? The system of colored belts that we use is simply a means to break down the curriculum and to provide a visible indication of approximately how far a student's study has progressed. 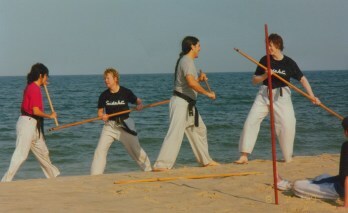 Each belt level has a syllabus - a set of techniques, forms, and drills - that the student must demonstrate competence in before being promoted to the next level. The order of belts used in Seido karate (other styles use different orders) is as follows: White, Blue, Yellow, Green, Brown, Black. At each level below Black Belt, there is also a corresponding "advanced" rank - Advanced White, Advanced Blue, and so on, which is indicated by a patch sewn on to the end of the belt. This forms a total of ten kyu ranks below Black Belt. At Black Belt a student progresses from shodan (first degree), to nidan (second), and so on up through (in theory) judan (tenth). In traditional Japanese karate ranks above godan (fifth dan) are rare. Only a handful of people, the greatest master teachers, are ever awarded the rank of kudan or judan (ninth or tenth degree Black Belt), and even then usually not until the age of 60 or 70. There is no guarantee or limit on reaching shodan (first degree Black Belt). It is entirely up to the students' time and effort in training. However, in Seido about five to eight years is typical. Some students may take ten years or more; others may take only a few years. It is important to keep in mind that attaining Black Belt level is not a completion of training; it is in fact just the beginning.